FC Bayern attempted to ruin RB Leipzig’s compactness with strong overload on the ball-side, supported by good spacing and quick interplay within their offensive ball-orientation as they continuously tried to exploit Leipzig’s underloaded side. Overall, the host constantly tried to create space on the flank trying to utilize the presence of Arjen Robben, on the right, as well as provided many opportunities for Douglas Costa to make penetrative movements through the touchline using his superiority in one-on-one situation. As usual, Robert Lewandowski and Thiago Alcantara played huge role in Bayern’s offensive-scheme. Bayern, the best home record hosted the match against the best away record. The 1st rank versus the 2nd place. One of the most waited clash of the 2016/2017 campaign. Against a such highly-compact side, Carlo Ancelotti’s boys managed to display strong ball-orientation within their offensive movements. With the strong ball-orientation Bayern created many valuable overloads on the ball-near area which, in turn, opened-up space on the far side. As we can see, after an overload and switch from the left side, Bayern tried to set Robben free through the combination of Robert Lewandowski and Philip Lahm. This strategy worked-well supported brilliantly by the amazing Thiago Alcântara. Bayern created many fast-vertical moves after switch, as Robben, Lahm, and Lewandowski alternately gained space on the wide around the half-space and flank of Leipzig’s penalty area. Situationally, on the other attacking situation, as Bayern tried to penetrate through the ball-side, Lewandowski would drop even deeper than Robben because the Polish acted as the connector for Bayern progression from their deeper-area. Combined with deep-run by the captain, Bayern looked to plot Robben’s as the final-passer or any direct execution-action since the Dutch have been well-known to be good at cutting-inside to create the shooting-space. Sound good. But, on the other side, the host looked to be getting difficult to create highly-valuable opportunities, at least before the first-goal, since the chances-creation actions were easily-managed by RBL’s 18-yard box defense. For example, Robben could display some cutting inside movements as he progressed with ball on his feet, but the nearer to the box the more difficult for him to penetrate diagonally directly into the box. Hassenhuttl’s troops managed to block the direct-access and in turn forced him to pass it out to the flank which ended-up with many easily-handled crosses. How about the left side? With the presence of David Alaba and Douglas Costa on the left flank, Ancelotti would have been surely trying to rely on their individual-ability. There were many double-occupations on the flank followed by a quick combination and shifts between two nearest corridors as Alaba, Costa, and Thiago interchanged on the left pitch (half-space and flank). Some strong connections supported by highly-pressure-resistance would have been easily found here. The orientation was simple, playing it wide to create as many as possible opportunities for Costa to accelerate with his speedy-dribble. The wing orientation in the circulation among the trio was strong. As it, in some situations, had even perceived Thiago to turn outside instead of inside since it might have benefited made them as it would have got them closer to the central area. In some situations, Thiago made a half-turn to the wide although it seemed to be a potential breakthrough movement via the more central area had he turned into the center. For RBL, as usual, the orientation of attack is playing it directly to the last line relying on the aerial duel of Yussuf Poulsen. 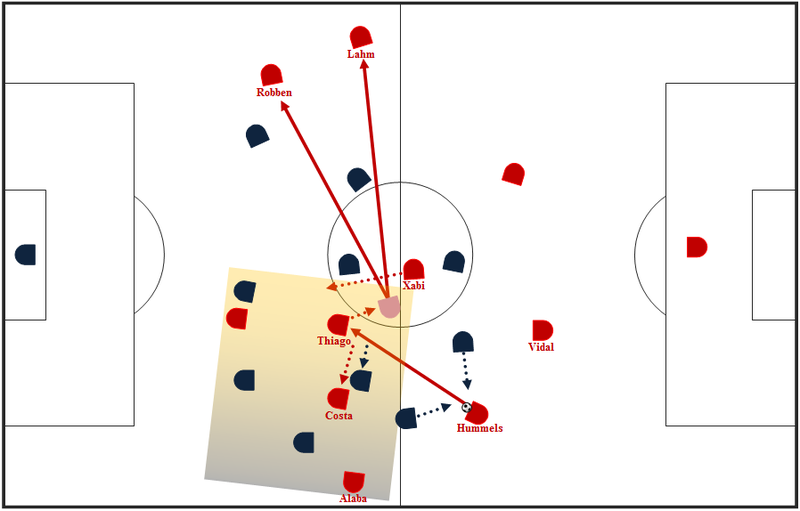 The Danish striker started his movement from the right-wide of Leipzig’s attacking direction from which he would move laterally to the center or near half-space to make some flick on to the upper-ground, to the front-three who occupied the opponent’s intermediate-defense to offer multiple options for immediate box attack. Against such pattern, Bayern focused to stay compact to defend the central area supported by quick two-direction press, which were the backward-press by the six-pair and the onward-press by the back-liners. Despite Poulsen could still managed to win most of his aerial duels, the efficiency was quite low since Leipzig could only get single shot to the goal from such tactic. Bayern’s shape allowed them to keep the central area stayed secure which resulted some dispossesses, etc. The physicality of Vidal and Alaba proved to be crucial on how Bayern regained possession after the Poulsen’s flick-on. The six-pair could make the needed backward-press after Leipzig’s front line managed to win the second-ball. Especially Alaba, his initial duty was to cover the lateral run of Poulsen. The left back tried to delay the tower striker to move to the center. After that, Alaba also had to quickly move back to the defensive-line as he had to defend the left-back area. Bayern’s compactness around the center had managed to force the away side to move wide or made many turnovers in the center. Which also being the reason of the low expected-goal of the guest. As the constructive-phase began from the back, Xabi Alonso and Arturo Vidal alternately dropped deep into the first-line provided strong connection in the deep-circulation. One of the six stayed slightly-higher to occupy the six-zone in front of the first-line. With Xabi and Vidal, along with the central defender duo, occupied the first two-lines in Bayern’s build-up, it was clear Ancelotti needed his players to make sure they had stabilized the deep-circulation before making any progression. Vidal often found dropping deep and acted as a (left) half-back or center-half, helped team to progress the ball through the near half-space or flank corridor. By dropping deeper, the Chilean was also providing the needed cover in case Mats Hummels made a forward-movement – something that more often seen in the second-half, as Bayern lead the score line and one man up. But, the key of Bayern’s progression from their first-phase was not only generated by the movement of Vidal/Xabi. Without structural adjustment and good spacing, it would be nearly impossible for Bayern to cleanly progress considering how good RBL are at executing their pressing system. The overload on the near half-space and flank was the key. First, the full-backs stayed wide and kept the distance ideally-close to the first-line. By staying wide, occupied the same line (in horizontal stand-point) with Leipzig’s six, and ideally-close to the first-line of Bayern’s deep circulation, the full backs were maintaining the good attacking connection as well as kept RBL’s wide-10 to stay deeper. “Deeper” means on the same horizontal line with RBL six-duo, since the wide-10 were engaged to the opponent’s full-backs. Because the wide-10 were forced deeper, the numbers of Leipzig’s pressing line was reduced from four to three lines. RBL used to press with a three banks of two + four (4-2-2-2), but the adjustment they made here had altered it to a two banks of four + two (4-2-2) formation. In the half-space, behind Leipzig’s second-line, Thiago and Costa made a double-occupation and avoided Bayern from being underloaded in the near half-space as well as provided strong overload for progression. The presence of these three (Alaba, Costa, and Thiago) had kept Leipzig second-line from making a quick and intense onward-press as they used to do. The next benefit, it kept the opponent guessing; where the attack would next be directed, would it be to the nearest corridors or switched to the far side. The off the ball movements from Costa and Xabi were also crucial (see info graphic below). From the half-space, Costa dragged RBL’s near CM wide and opened up space for Thiago. While Xabi vertical run perceived RBL’s players to stay in the center. The positioning of Hummels was important, too. Since the center back moved to the half-space, he enabled himself to have two different strategic options of attack, the center (through Thiago) or the flank (through Alaba). Since Costa managed to drag his marker wide and allowed space for Thiago, Hummels fed the ball toward the center to Thiago. After receiving, the Spaniard made a quick shift and switched to the far-side. When Bayern constructed the play from the deeper area (early third) and Leipzig’s near wide-10 moved up to press Bayern’s half-back, the opportunity for Bayern to progress through the full back was opened. For instance, when Leipzig’s near #9 and wide-10 pressed high, Vidal could easily by pass the press by simply playing it diagonally to Alaba. His explosiveness and pressure-resistance allowed Alaba to progress quickly through the touchline. Had Leipzig’s near CM managed to cover his movement, Alaba would have had Thiago on the near half-space as the passing-option to generate quick one-two combination, for instance. Here, things were rather complicated for Hassenhuttl’s boys though. On the other occasions, if possible, Bayern made use of the remarkable passing ability of Hummels and Xabi. Bayern relied on the diagonal long ball pass from the two to exploit the ball-far flank or half-space within Leipzig’s ball-oriented press. Notice on how Hummels and Xabi made diagonal long balls to the flank and instantly provided immediate attacking space closer to RBL’s penalty box. Bayern earned many progression space from such play. They attacked through the wide and made some crosses. Or, at times, they started from the flank and quickly cut inside toward the center to create chances closer to the danger-zone. Here the other (minor) problems occurred. The first, with the wing-orientation in Bayern’s attack, Lewandowski often found occupying the wide-right area to pick up the said long diagonal ball. His physicality enabled him to create quick combination or chances from the wide. But, on the other side, with their #9 moved wide, Bayern only left Thiago as the finisher (the passing target) in the box. The problem is clear, Thiago was not a good aerial-one which surely made it hard for Bayern to gain many positive outcomes from their float-cross, with Thiago as the target-man. The next issue, was, as aforementioned, Bayern’s crossing play was hardly efficient since many of them were easily-handled by RBL’s 18-yar box defense. The far half-space and flank were the weak area of Leipzig’s pressing system within their highly strong ball-orientation. And Bayern were able to exploit that weaker-side by overloading the ball side and played through the opponent’s press utilizing the individual-brilliance and highly-pressure-resistance-level of their own players. Although it was difficult for Leipzig to overcome this Bayern’s overload and switch, but, when the host got closer to the box, RBL’s shifting enabled them to block the diagonal access to the center. The far-side wide-10 and full back supported by the far-side CM and CB responded well as they managed to establish a lot of numerical-superiority situations which stopped Bayern from progressing through the center area. Many of Bayern wing-play were ended-up with float crosses because Leipzig’s defense managed to block the diagonal access toward the center…. until the first goal. For Leipzig side, their build-up play was more simple. As ever. The circulation in the first-line was only intended to provide enough time for the front-line to establish the desired narrow-shape. The purpose was clear, Leipzig would play it long to Yussuf Poulsen, relied on his aerial-ability to earn some valuable flick-on, then collected the ball, and made a quick attack through the multiple movements among the front players. Good defense by the host, as their horizontal and vertical compactness managed to stop most of Leipzig’s progression after the Poulsen’s flick on. Thiago, Xabi, and Vidal were all playing to their maximum capacity as they made a lot of valuable actions in such situations (interceptions and tackles). The first goal shows us how brilliant Bayern’s players were, both in defensive transition and at keeping possession. In a defensive transition, Thiago tracked back and regained possession as he dispossessed Diego Demme. With his on-ball skill, Thiago progressed, managed to beat Naby Keita, and found Alaba on the left touchline. In a very quick moves, Leipzig created a 6v4 numerical-advantage situation and trapped Bayern on the touchline. Leipzig trapped Bayern on the touchline. But, with the individual skills and pressure-resistance, this “Bayern’s 4” managed to keep the possession and made a pass to Xabi which followed by a quick switch to the right side of the pitch. Costa and Alaba on the left side then Robben and Lahm on the right one were assigned with different duties. On the left side, Costa was used for his explosiveness. The Brazilian often swapped with Alaba, as they interchanged between the half-space and flank. When carrying the ball on his feet, Alaba would try to widen the space for Costa by moving inside toward the center before releasing a flat pass to the flank provided better angle for Costa to penetrate through Bernardo’s defensive-area. Thiago, on the other hand, whose movement often supported these wide-men, acted as the one to add more dynamism in the circulation. He often made quick vertical and lateral actions (pass, dribble, drive) around the center area, half-space, and flank. With his physicality, Thiago occasionally dropped-deep to help advancing the ball. Such move was usually triggered by the bad-spacing of Bayern’s six and central defender. The bad spacing which provided the pressing-access for RBL’s front line and held Bayern from progressing the attack. Thiago would drop deeper to the available space to help progressing, although it was not always ideal since the movement only created more pressing-access for RBL into Bayern’s half. In Bayern’s first goal, their spacing in attack created a very good positional-structure as well as strong connection. But spacing also being the issue in Bayern’s strong performance. Sometimes, it occurred on Bayern’s constructive-play. Xabi Alonso, Vidal, Hummels, and Javi Martinez were found positioning too close to each other which made it hard for Bayern to cleanly progress the ball. On the other occasion, it was the bad choice of passing direction from the first-line to the six that killed the potential-progression. For instance, in a moment of build-up from the back, Hummels should have passed the ball to Xabi’s right foot as it would have enabled Xabi to make an immediate onward movement throuh the center. But, instead of playing it to the right, Hummels released a pass into the left foot of Xabi which forced the six to make more adjustments and allowed more times for Leipzig to put an intense press to Xabi from his blind-side (back). The other (ultimate) example for bad spacing and the dreadful effect of it, was none other than Bayern’s second goal. After Forsberg was sent off, Hassenhuttl move Sabitzer to the left and dropped Poulsen to the right wing. 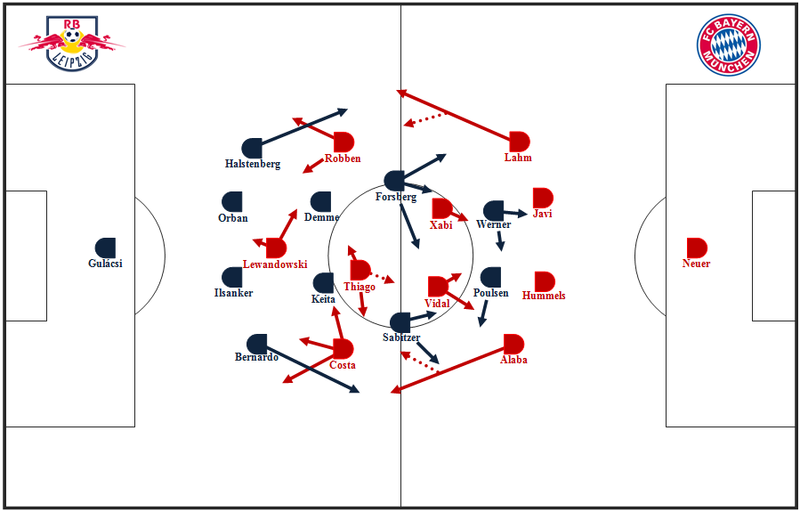 As Poulsen was played on the right, Leipzig’s attack would also adapt it since the Danish is one of the prime long passing target in Leipzig’s attack. In support of this play, Sabitzer often seen moving up to the central area with Werner shifted wide to the right tried to create play through the flank. The problem was the same and even bigger for Leipzig. With 10 men, the intensity in their first-line of press was greatly-reduced. Sometimes, they won the ball and progressed through the center, but since they got only single no. 9 up-front, the guest were getting difficult to find the direct access through the center which in turn forced them to play it through the wide area. 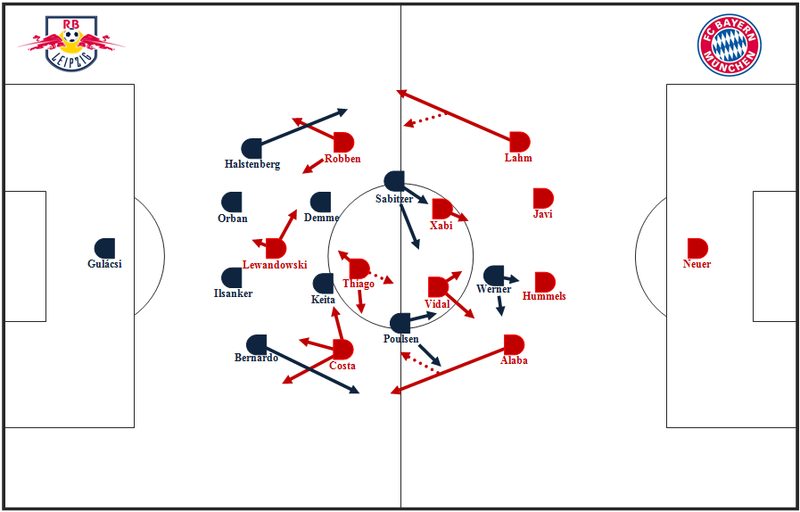 On the other situation, Leipzig also found it hard to penetrate through the flank as Bayern managed to make quick horizontal shift and created many numerical-advantage on the touchline. The root cause was the same, less presence up-front had greatly weakened Leipzig’s ball-orientation attack. Down to 10 men also negatively-impacted to their defensive-transition game. Bayern could quickly regain possession by overloading RBL’s attacking-line, for instance in a battle of 2nd ball after an onward header by Leipzig’s middle line. In the second-half, Bayern made another change. Robben out and being replaced by Ribery. Costa shifted to the right and Ribery played on the left. Bayern still played with the attacking-pattern they had displayed from the first-half. They overloaded the left side to open or widen space on the right side. The big chance by Lewandowski of 50th minute was the ultimate instance. A quick switch and wing overload on the underloaded side with the combination between the wide-men created space in the danger zone of Leipzig’s 18-yard box. Lewandowski and Thiago alternately occupied the half-space and the center between the lines. They moved across the field to establish strong shape in order to create strong attacking connection. This suited to Bayern’s attack that the focus on the central area increased greatly in the second-half. The host constantly seek the chance to get into the box by playing around the space between the lines. They were trying to play around RBL’s structural block by playing some rotational movements between the 9 and 10. A comfortable win for The Bavarian. Their heavy wing-orientation was well-practiced in the first-half. In the second-half, Ancelotti made a slightly alteration as they were trying to hit Leipzig through the central area more than they did in the first-half. Some nice rotational movements between the 10 and 9 post managed to create space and chance for Bayern in the danger zone. The Emil Forsberg’s red card followed by Lewandowski penalty clearly killed the game. With 10 men, Leipzig lost their pressing capability. They were heavily-beaten in the first-line and also found it hard to cope against Bayern circulation in the space between the lines, as the host managed to create chances through the half-spaces and center. This entry was posted in tactic and tagged Bundesliga, Carlo Ancelotti, FC Bayern, Gegenpressing, Pressing, Ralph Hassenhuttle, RB Leipzig, Robert Lewandowski, Tactical analysis, Thiago Alcantara, Yussuf Poulsen. Bookmark the permalink.